"Adventurous, courageous and foolish in fairly equal measures, Peter has drunk, snorted, inhaled and otherwise extensively fed deeply from the ingenious pharmacopoeia of the Amazonian shamans. In his latest tale Sapo In My Soul, he recounts his dramatic discovery of the use of sapo frog among the Peruvian Matsés. Using his well-developed eye for detail and driven by innate curiosity, Gorman shares his early days of sapo discovery, and sets the scene for the examination of sapo's novel peptides by pharmaceutical entities. Observent, self-revealing, at times funny and always raging forward, Peter Gorman reminds me that people at the margins define any endeavor. Gormn with his rough talk, his journalist's eye, his seemingly alarming lack of regard for personal safety and his various well detailed mishaps, makes an ideal narrator for this tale. Discoveries are many, and researchers are always coming up with new candidates for drug development. But in Peter Gorman's narration, the use and investigation of sapo simultaneously fascinates and entertains, albeit in an often squirmingly uncomfortable way." "This is a wonderful account. And Peter's portrayal of sapo reminds readers that the wild is very wild indeed." "Unlike ayahuasca, the purgative venom of the Phyllomedusa bicolor tree frog, or sapo, is called "ordeal medicine" by the Matsés. 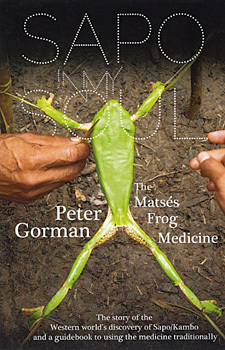 Peter Gorman's new book charts his personal rediscovery of sapo, as well as his ongoing love story with the jungles of South America and the people and spirits that inhabit it. Gorman has gone through a tremendous ordeal to bring this timely medicine to the global tribe; reading it will not kill you, but it will make you stronger.